Surf packages designed for women of all ages and surfing abilities who are seeking to learn, discover new adventures and have fun. located in Hawaii, the birthplace of surfing. With warm water temperatures, the world’s best waves, and plenty of Aloha, Hawaii is THE best place on earth to attend a women’s surf camp. These are the words that inspired Me-Shell Mijangos to quit her corporate job in New York City and travel the world in search of perfect waves and faraway adventures. Along the way, Me-Shell landed on the island of Maui for what she thought was going to be a two-month stay. Maui beckoned and Me-Shell listened. She decided to plant her surfboard and unpack her bags for good in paradise. Realizing an opportunity to create a wellness program for women, Me-Shell founded SwellWomen, a Maui vacation that combines two of her blissful passions, surfing and yoga. From the start, SwellWomen has flourished thanks to exposure from the national and international media. And, of course, to the continuous referrals from satisfied guests who have been treating themselves to SwellWomen’s surf and yoga camps since it’s establishment in 2003. SwellWomen continues to grow, and now includes Swellco-ed, surf and yoga vacations open to men, women and couples. You’ve dreamt of white sand beaches, tropical nights and cool ocean breezes. The island paradise of Maui, Hawaii has happily been our home since 2003. With its warm weather and perfectly shaped waves, it’s not surprising that the term paradise refers to the Hawaiian islands. On Ka’anapali Beach at the foot of legendary Black Rock, this tropical oceanfront resort welcomes SwellWomen guests to a world of relaxation and discovery. Featuring 23 acres of tropical paradise, the Sheraton Maui Resort and Spa is situated along the best stretch of Ka’anapali Beach and was once the playground for Hawaii’s royalty. With a 142-foot lagoon style pool, it’s no wonder why the Sheraton Maui consistently gets voted as one of the Top 25 Hotels in Hawaii by TRAVEL + LEISURE Magazine. With breathtaking views of the islands of Lanai and Molokai, this gorgeous property provides our guests with the ultimate in comfort and relaxation in an inspiring setting. The Sheraton Maui Resort and Spa recently completed a 6.5 million dollar renovation to all guest rooms and suites. The resort’s newly refreshed guest rooms introduces warm Hawaiian colors, textiles, and prints to the legendary oceanfront resort. Incorporations such as traditional Hawaiian artwork, lightly hued paint colors, plush carpeting and drapery, and new tropical furnishings have created a comfortably lush setting for guest’s to enjoy. You enjoyed your spa service and would like to indulge in additional bliss. Take time to luxuriate in additional treatments during your stay. Here is a menu of just some of the spa treatments available to you. For the active ones, get much needed relief as your therapist works on muscle groups leaving you refreshed and renewed. Bringing you ‘heaven on earth’ as the soothing energy of warm, smooth, stones assists the therapist in melting away tension patterns held in the body. Go the Hawaiian way! Traditional Hawaiian massage uses beautifully flowing long and rhythmic massage stokes to enhance relaxation and reduce muscle tension. Feel the heat of this warm body scrub with made on Maui Queen Bee exfoliating and detoxifying salt scrub. Been out in the sun for longer than expected? Take your body to a pleasantly cool place with this bath soak treatment. Rest your feet upon dozens of smooth black rocks as the pressure points in your feet are massaged. A warm stone massage softens and relaxes the most tired of limbs while a therapeutic masque and papaya/pineapple scrub brings vital energy back to the entire body. You roll your yoga mat out on the fresh green grass as the sunshine streams through the surrounding landscape and warmth radiates you from the inside out. You attune to the chorus of tropical birds as they serenade you. It’s time for the 6,000 year old practice of yoga, and what better place to practice than with other SwellWomen on the magical island of Maui. Your day will include a yoga class by a qualified and professional yoga instructor who will take you through a journey of poses that complement the muscles used in surfing. Are you brand new to yoga ? As they say in Hawaii, “No Worries.” Our yoga instructors are experts at teaching classes geared to all levels from beginner to advance with patience and care. While your Hawaiian wellness vacation will be filled with lots of surfing and yoga, there is a plethora of other activities to choose from as well. While some of the activities incur an additional charge, many activities are free of charge. swimming, snorkeling, kayaking, windsurfing, hiking, cruises, helicopter tour, Hawaiian scuba lessons, cooking, stand up paddle boarding, golf, tennis, and more. If all you want to do in your spare vacation time is lounge on beautiful beaches, then we’ll point you to Hawaii’s best beaches. If you want your vacation to be stuffed full of unique Hawaiian activities like hula dancing or lei making, then we’ll make sure to find the right activities to suit your needs. The Swell Experience is a one-of-a-kind women’s surf and wellness vacation in Maui, Hawaii designed for all women who seek the thrill of adventure, the reward of accomplishment and the fellowship, and encouragement of new friends. Our surf packages are designed for women of all ages and surfing abilities who are seeking to learn, discover new adventures and have fun. With every detail taken care of, it’s no wonder that SwellWomen guests return year after year after year. Solo travelers, pairs of friends, small groups and family members are welcome. Solo travelers opting to share a room will be paired with other solo travelers. There is no maximum age limit. Guests under 18 must be accompanied by a family member and must be at least 14 years of age or older. No prior surf experience is required- most of our guests are beginners or have surfed only a few times. No prior yoga experience is required- we are able to accommodate absolute beginners to advanced levels. However, it is recommended to take a few yoga classes before your surf and yoga vacation. Guests of all surf levels and yoga backgrounds are invited to join us. Guests must be in good health, physical condition, and know how to swim. A $400 Single Supplement (50% off the difference of a private room and and double room) will be applied if a guest books a double occupancy room and we can not find a roommate for our guest. In which case, our guest will be upgraded to a private room for an additional $400 Single Supplement fee. As the name suggests, SwellCo-ed surf retreats are open to men and women adventurers and couples. SwellCo-ed is designed both for first-time surfers eager to try the ancient sport of surfing in an atmosphere of supportive friendship, and for experienced surfers who want to share their passion for the waves. The wellness vacation is suited to couples who want to surf together and like-minded adults interested in surfing with someone new. SwellCo-ed retreats are custom retreats offered to groups of 12 or more. If you have a group of 12 or more and would like to participate in a SwellCo-ed Wellness Adventure, please let us know. Once we receive your request, we will get started on creating a memorable surf vacation for you and your friends. Let the warm aloha spirit embrace you as you enjoy your women’s surf vacation in the luxurious resort setting of west Maui. 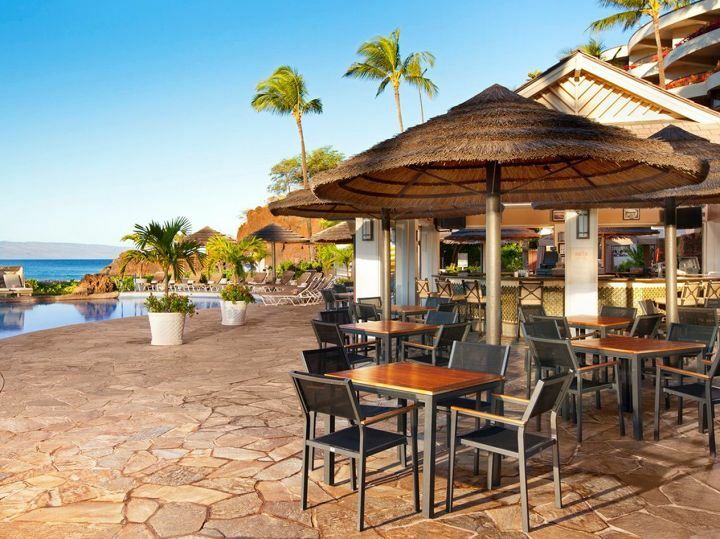 The Sheraton Maui Resort and Spa is set amidst 23 tropical acres along a mile stretch of the famous white sand beach of Ka’anapali and next to the legendary Black Rock. Here in this pristine setting, all cares fade away as guests experience the sights, sounds and flavors of Maui. Six night accommodation at a gorgeous and breathtaking 4 star oceanfront resort surrounded by 23 acres of tropical gardens, a 142-yard lagoon style pool, views of the neighboring islands of Lanai and Molokai, and views of the majestic West Maui mountains. All Guest rooms include a private lanai, unlimited wireless high speed access, Sheraton Sweet Sleeper® Beds with 300 thread count Egyptian cotton linens, large private bathroom, 40” high-definition flat-screen TV with cable, central air conditioning, daily room attendant service, in-room safe, mini-refrigerator and complimentary coffee and tea replenished daily. Embrace a breathtaking Maui sunset on a Dinner Sail aboard a luxury catamaran including your departure dinner and an open bar. Each participant will receive a Goody Bag valued at $125.00 which includes a complimentary SPF long sleeve rash guard from Carve Designs. We want to take care of you. We nurture you. We know that you work hard juggling family, career, or both, and it’s important to us that you feel nurtured and rejuvenated throughout your stay. From your balanced daily program, to your professional spa treatment and outdoor yoga classes, you are our main focus; the one being cared for. We nourish you. Each morning you will enjoy a delicious and sumptuous breakfast to keep you fueled for your entire surf lesson. Healthy surf snacks will continue to nourish you so you can focus on surfing. A delicious welcome dinner and an inspiring departure dinner on a luxury catamaran will have you feeling blissful and complete. We comfort you. The Sheraton Maui Resort and Spa provides clean air-conditioned rooms with private lanais, daily housekeeping, wi-fi service in each guest room, comfortable beds with high thread count sheets, and many other amenities to make your stay heavenly. We strive to be the best. What makes SwellWomen the best? We listen and implement valuable customer feedback. We are always striving for perfection. Both our offices and retreats are located in Maui full-time. We know our island and it’s people. We have established relationships with professionals to ensure your vacation is nothing but the best. Unlike most women’s surf camps, we have a limited amount of retreats during the year and ours are scheduled during the most optimal times to visit Maui. Why do we do this? Think fewer crowds, blissful weather and consistent surf. We live Bliss and provide each of our guest an atmosphere of Aloha at our SwellWomen vacations. We get to know you and you get to know each other, creating lasting friendships. Experience harmony and well-being with a professional spa massage at The Spa at Black Rock. Transportation to all activities throughout your vacation week (excluding transportation to and from the resort location). Stunning 142-yard lagoon style pool with jacuzzi. The legendary Black Rock for premier snorkeling is located at the resort. On location night-lit tennis courts and pro shop. Complimentary scheduled shuttle service to Ka’anapali properties and historic Lahaina town. 24 hour state-of-the-art Fitness Center. Enjoy six mornings of a sumptuous breakfast buffet at an oceanfront open air dining venue. Welcome dinner and Departure dinner are included. Surf Snacks throughout the week to help keep you fueled and nourished. The Yoga and Wellness Experience is an important element of your SwellWomen surf vacation. What better place to tune into your well-being and experience positive benefits than on the magical island of Maui. Guests leave our surf and wellness retreats not only feeling refreshed, rejuvenated and inspired but they also feel ‘The Bliss’ of experiencing a renewed sense of enjoyment for life, family and even their career. It begins with rolling out your yoga mat and experiencing the 6,000 year old practice of yoga. Next, get ready to be pampered by a licensed massage therapist with options for additional spa services throughout the week. How do we fit so much into one day? By taking care of all the details so that you can truly enjoy your women’s surf camp vacation. The schedule may change according to surf conditions or other events that may be added to your women’s surf and wellness package. Do you need to participate in everything? We are here to provide many options for you to choose from. If you opt to relax by the pool the entire day or choose to participate in only one activity per day, you will be supported in that decision. It’s your surf and yoga vacation, and we are here to accommodate you in whatever choice brings you the highest bliss. Stand-Up Paddle Boarding, also referred to as SUP-ing, is a rapidly growing global sport originating from – you guessed it – Hawaii. 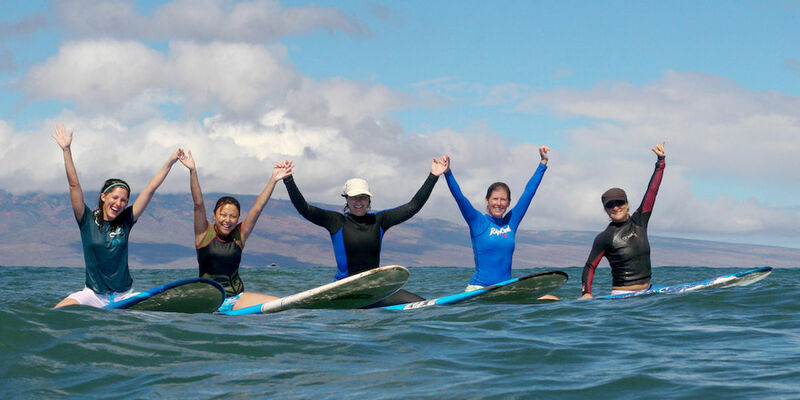 SwellWomen is one of the only women’s surf camps in the world that also offers this fun-filled activity to our guests. What does SUP-ing have to do with a women’s surf camp? We love SUP-ing because it offers a strong ‘core’ workout, and is a wonderful cross trainer for surfing. It helps with balance and core strength, and helps tone the legs. SUP-ing allows our land locked guests the opportunity to cross train for surfing at home; visit your nearest lake and practice your SUP-ing there ! By offering SUP-ing, in addition to surfing, you have reason to extend your water time, all whilst improving and strengthening your surfing skills. The surf instruction occurs both in the water and on the land. You will gain confidence in learning how to surf, understand and practice surf etiquette, and see how surfing is a metaphor for achieving your personal goals. Your surf instruction comes from the most popular surf school on Maui, Goofy Foot, established in 1994. Their instructors are among the best in the nation and have current American Red Cross First-Aid and CPR training. Each instructor has at least eight years+ of surfing background and a minimum of five years or more of surf instruction expertise. You will be provided with quality surf instruction during your surf lesson in a safe and non-competitive learning environment and the surf instructors will create a fun filled experience for you with memories to last a lifetime. As you progress, you will be provided with a variety of surfboards including soft tops and custom-shaped performance surfboards to enjoy on Maui’s gentle waves. Surf lessons with professional, patient, and knowledgeable surf instructors. One professional photo CD capturing your surfing highlights. Stand-Up Paddle Boarding is popular for water fitness, core strengthening and surf cross training. Your SwellWomen Vacation also includes a lesson in this Hawaiian born sport. Yoga classes that focus on opening and strengthening the muscle groups used for surfing. Top quality and variety of surf equipment including soft foam boards and custom shaped fiberglass boards. There is a reason why surfing was born in Hawaii, the reason is the perfect waves and gorgeous turquoise warm waters. No wet suit required! With the perfect surf break including views of the Maui west side mountains, both never-ever surfers and intermediate surfers are sure to enjoy their morning surf lesson and recreational surf opportunities throughout their week. Expect rolling waves to greet you each morning and glassy waves to end a perfect day. Thermal winds are regular all year long and blow from the East. On Maui’s North coast, the wind can strongly blow from S/SE, near Hookipa and provides dangerous offshore conditions for funboarders and very heavy tubes. Not much tide, but the coral bottom makes some days very dangerous. The water changes from 24° to 27°C. Wear a spandex and tons of sunscreen. Be careful to currents making the spots sometimes dangerous, swallowing you on the inside. Kaanapali : North of Lahaina. A rocky point where a great, hollow and fast wave is unrolling. S-Turns : Soft and nice left for longboarding, coming up towards Kahana. Honolua : A mythical wave working in NE swell. A long and hollow right, take-off near the cliff, then unrolling in the bay to end up in a very fast section. Not easy to surf and crowded by locals when it is working. Honokohau : At the end of a track. A nice right in the area of Honolua Bay. Waiehu : Urban area. Nice peaks in lefts and rights.Hookipa : A world-class spot for funboarders, because of its violent winds regularly coming up. Fun to surf in quiet days.Pavillions : On the Eastern end of Hookipa Beach Park bay. A solid quality peak. Jaws : Located near Hookipa bay, in Peahi, the monster sometimes wakes up to provide crazy conditions, only for people who know well the place. Advice: take your binoculars, go on the cliff and watch the beautiful view. Captain James Cook noticed in his second expedition in the Pacific, that indigenous people enjoyed waves and rode incredible skilled longboards shaped according to a ritual inside the trunk of a tree.By this confrontation with the Ocean, the best rider would get a high position within the community. This is how the story begins…"He e'nalu" (that can be translated by « wave sliding ») feeds the legends, crossing for centuries, the story of this Polynesian-Hawaiian society of which we find today the spirit at North Shore’s surfing contests, on the most solid waves of the globe. No, you are not dreaming, you are in the surfing paradise.From Jaw the monster on Maui, to Pipeline the board eater, from Waikiki and its Americans with flowery shirts and big bellies, to very protectionists locals.Surf shops at every corner, an American life-style, but also a strong tradition and a gorgeous and preserved nature inside the lands…Hawaii, land of contrast, is carrying living standards but remains a mythical place every winter when the regular and huge lines unroll on its coasts. The archipelago was populated starting the 5th century by Polynesians. However, the islands were discovered by the British explorer James Cook only in 1778. He first named them Sandwich Islands in honour of its protector, John Montagu, 4th Earl of Sandwich. The archipelago then inhabited by about a million of Polynesians, was divided into four kingdoms but the King Kamehameha the 1st succeeded in conquer almost the whole archipelago in 1795. In 1820, American Presbyterian missionaries settled in the islands. Hawaii’s independence was recognized by the United States in 1842 but France and Great Britain opposed. Then, the archipelago became the centre of attention of the huge confrontation between those 3 powerful nations during the 19th century. At that time, the British colonists developed their sugar-can plantations and needed a lot of cheap work force.Between 1851 and 1896, the Hawaiian Board of Immigration called in 46 000 Chinese. Then, Portuguese workers coming from Madeira and the Azores and Japanese and Korean workers joined the local population.Unknown diseases quickly decimated the Polynesian population. In 1893, the Hawaiian Queen Liliuokalani fell and the Republic of Hawaii is declared on July 4th, 1894 and then annexed to the US. English was right away proclaimed Hawaii’s official language. From that moment, it became illegal until 1987 to learn Hawaiian in the public schools of the island. The development of economic infrastructures, naval and air ones and the use of the island as a military basis guaranteed Hawaii’s prosperity.Becoming the main axis of the American defence in the Pacific, Pearl Harbour’s naval basis was the target on December 7th, 1941, of the Japanese air forces engendering terrible losses for the American fleet.In 1959, by referendum, Hawaii reached the position as the 50th American State. Honolulu, located in Ohau Island, is the State capital. Today, meeting place between the West and the East, Aloha State owns a blended culture, mixing hula and disco, TV shows and old cosmogony myths, hamburgers and Japanese tea ceremonies. If English is the leading language, it has borrowed many words and expressions from Hawaiian and Pidgin.Used to communicate between Hawaiians and the first immigrants, Pidgin is simplified English and still constitutes today a living slang. Hawaii constitutes a Polynesian archipelago geographically part of the Pacific. Hawaii’s archipelago has 8 main islands lined up from Northwest to Southeast over 2 400 km : Ni’ihau, Kauai, Oahu, Molokai, Lanai, Kahoolawe, Maui and Hawaii. The total area is 16 600 km², which would be like half Belgium. There are all volcanic islands. Hawaii, the largest and Southern island of the archipelago has 5 volcanoes of which Mauna Kea, is the highest point (4 205 m) of the archipelago and Kilaurea the most active (eruptions in 1925, 1954 and 1960). Earthquakes and tsunamis go with the volcanic phenomenon. The archipelago has a tropical climate, temperate by oceanic influences, Northeast “alizés” and great heights of the islands. In several cables’ lengths in the East, there is Maui, beautiful territory with green plains and crystalline lagoons.Haleakala volcano looks down at beaches like Black Rock, Ka’anapali in the West or Ho’okipaa in the East. In the heart of the wild island, gigantic waterfalls mix their water to the Pacific ones, in the absolute luxury of Kula Forest Reserve. The island is a paradise for athletic activities: scuba diving, kayak, excursions, horse back riding, and ecotourism tours, dandled by the cool and delicate atmosphere of the Hawaiian culture. The biometric passport is necessary since November 2005. Every tourist must have a valid passport. No visa for stays of less than 3 months. New conditions of entry in the US for intermediate landing passengers or in transit started since 2005Following a decision of the American State Department, French nationals have to hold an individual electronic passport since 2005 to be eligible to travel in the US. Children (from 0 to 12) are also concerned by this new law and must have an electronic passport as well.This regulation was made to secure the borders and was enforced by the United States. Hawaii’s national capital is Honolulu on Oahu. No specific vaccine. Provide yourself against mosquitoes and the sun. Quality hospitals and welfare centres. - 12 hours in summer and - 11 hours in winter. Tropical climate. Average temperatures change a little between winter and summer. The rainy season goes from December to March and the dry season from April to November. Average temperatures: between 20° and 30°C. You can rent cars, 4X4, motorcycles on every island. Easy driving and not much traffic. The tap water is drinkable. 110 V. Bring an adaptor with US connections.110/220 V / 60 Hz.Like in every state of the US, Hawaii has a different data conversion from the British version. Distances are in inches (about 2.5 cm), in foot (0.30 cm) – it is useful to see what surfboard to take…or measure Jaws from the hill…in miles (about 1.6 km).Weights are in pounds. The US dollar.1 Euro = 1.31 USD.Credit cards and travellers’ checks in USD.Exchange in banks and hotels. Maui, called the «Valley Island» because of its central valley that splits both inactive big volcanoes, is known for its beaches where you sometimes may encounter sea turtles.It is easy to go in the highlands or tropical forests, eucalyptus woods and farms on the East coast. The tourist infrastructure is gathered in Lahaina, Kaanapali and Kihei. Haiku, Kula and Hanaattract less tourists.East Maui is dominated by the highest inactive volcano of the world, Haleakala (house of the sun) culminating at 3 000 meters.Hiking tracks allow you to cross moon-like landscapes from the bottom of the crater, whereas the summit gives you a gorgeous view point to see the sunrise. With a mountainous land and a humid climate, the slope located leeward is covered with luxuriant vegetation.It can be passed around on going by the famous Hana Highway, making you go through the tropical jungle. High tropical forests, round hills, green prairies and gardens, wine-growing places spangle the island. You can also hike in Polipoli Spring State Recreation Areain Kula Forest Reserve.